I went to Brooklyn Bowl in Williamsburg with a couple of friends for the 1st time last Friday. It was a pretty dope spot... diverse crowd, spacious, cool decor, dj, and it even has a dance floor... but definitely waaaaay overpriced for bowling. We paid $5 cover each, $4.50 for shoe rentals each and $25 per half hour of bowling. Between the 3 of us, a 1/2 hour game totaled $54. I personally hate flushing money down the toilet bowl, so when I return to bowl, it's gonna be for this FREEBIE! Brooklyn Bowl. 61 Wythe Avenue, Brooklyn NY. 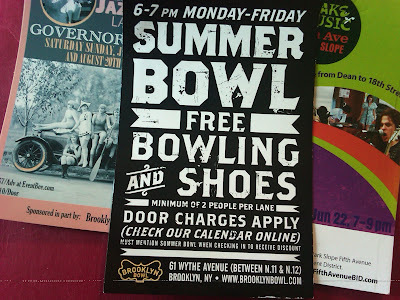 Monday through Friday from 6-7pm, Free bowling + shoe rental. You must say "Summer Bowl" to get the free deal. L Train to Bedford Ave stop. Exit at the rear of the train (coming from Manhattan), walk North on Bedford Ave. Make a left at N. 11th st, walk 2 blocks. Make right on Wythe, Brooklyn Bowl is on the right. G Train to Nassau Ave stop. Walk south on Nassau, make a slight right on Berry St. Make a right on N. 12th street, walk 1 blocks. Make left on Wythe, Brooklyn Bowl is on the left.